I do love that musty, incense-y, bosom-y church smell. I debated at lunch time whether I needed to visit a church today since I was at devotions this morning at work. 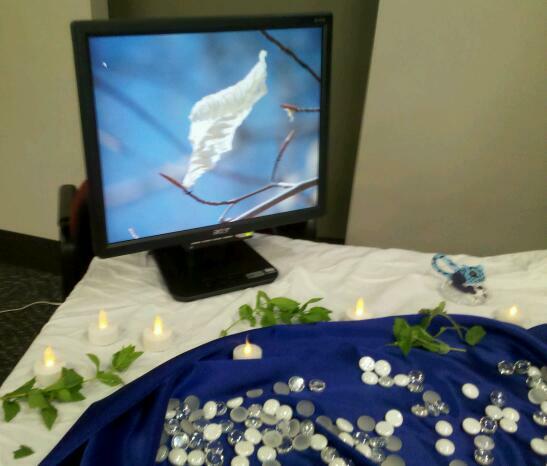 In the third floor conference room, we’d created multi-media worship stations, signifying Brokenness, Hope, and Beauty. We’d included fresh mint and time for conversation about the care of our shared space. The theme was care of the earth. I think that was the theme. I just did what the rest of the team told me to do. And, of course, before devotions started, I cracked jokes with Jim and Morais (because, we’d agreed, every worship team needs a few hecklers as they’re laying out their cloths and getting into the serious business of prayer.) Seriously, I’m lucky to be part of such a creative, inspiring worship team (thanks to Sushil, Christie, Jorge, Lisa, Felipe, Noemi, Kathleen). Back to West End, I waited for my Aha! moment, sitting in the bosom-y church by myself tonite. Nothing. I quizzed Shane about the quote when I bumped into her in the women’s bathroom. “Do you really think freedom is happiness?” Because I am looking for happiness. And freedom sounds like a good way to go. “As in freedom from attachment,” she said. “Ah,” I said. “Like detachment.” And this really helped me, because I easily get overattached — to ideas, to people, to this blog. I loved that. I loved that in looking for answers in a church, I remembered what my Yoga teacher told me. It’s not external freedom (which most people think is the answer: “If only I could escape from this person or this situation”), but the freedom we cultivate within that gives rise to happiness, whatever the context.